Wound G String (or Wound 3rd): Is It Right For You? Back in the 50s when Ernie Ball was teaching at his shop in Tarzana, California, he noticed a lot ofhis students we’re having trouble learning the popular rock ’n’ roll songs of the time because of the strings available. The most popular set back then was the Fender #100 medium gauge that had a stiff wound 3rd (kind of like a modern acoustic set). This was difficult for a lot of players to bend, especially those just starting out. He tried to find a solution, so he went to Fender and asked them to make him a smaller set, particularly one with a plain third, but was turned away. He got in touch with a string manufacturer and made some smaller sets that fit his needs. 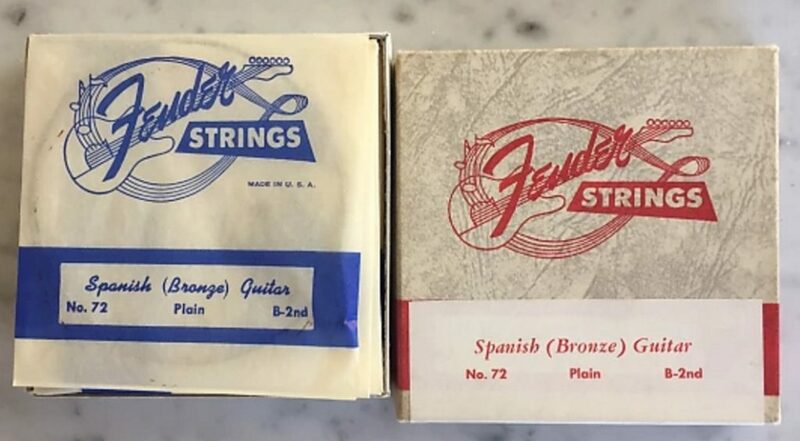 Ball’s music store began to receive a lot of attention after he started selling these strings and set him on the path to create the Ernie Ball brand. Before he did this though, the only other way to get a plain third was to make a set yourself. Players would ditch the low E string of a traditional set and add a banjo string in place of the high E. So the A string became the low E, the D string became the A string, and so on and so forth. This way players could piece together a set that had smaller gauges overall and most importantly, a plain third. So that, in a nutshell, is how plain third strings became popular. The wound 3rd vs plain 3rd topic is still a hotly-debated issue in the modern guitar world and you’ll find plenty of players that prefer one over the other. The main advantage of plain thirds is that they make bending easier (as we discussed earlier). They also produce less finger noise than wound 3rds. So if you’re a fan of super light tension and extreme bends, I would recommend sticking with a plain 3rd string. If you tend to favor 10 Gauge (Regular Light gauge) strings or higher, and you’re not doing a ton of extreme bending however, you might want to string up a wound 3rd on your guitar for a few reasons. Generally speaking, with a wound G string you’ll get better intonation on your guitar, and better tuning stability. Many guitarists think that a wound G string just sounds better, and balanced better tonally in a set with its fuller, warmer sound. They’ve remained popular among jazz and rhythm players for this exact reason. Is a Wound G String Right For You? At Stringjoy, we’re all about helping you find the perfect set of strings for you, and the best advice we can give is keep an open mind when it comes to trying new strings. So if you’ve been playing a plain third for a while, we recommend giving a wound 3rd a try, and vice versa—as always, experimentation is the key to finding what’s right for you. We also make it crazy easy to try out a wound G string. How’s that you ask? Well, while most string manufacturers only make a few sets with a wound G string—almost all of which are super heavy gauge—at Stringjoy you can opt for a wound G string on any of our string sets. Simply build a Custom set of Strings—at no additional charge—and select a wound 3rd string instead of a plain string (you’ll know the difference because on gauges where we make both wound and plain versions we put a “w” after the gauge to signify a wound string, and a “p” after the gauge to signify a plain string). The best part about this is that you can keep with the gauges you’re used to, and simply add in a wound G string that will keep the same tension as the other strings in the set. To do this, simply select a wound string that’s just a hair heavier in gauge than the plain string it’s replacing, to account for the reduced tension wound strings exert versus their plain counterparts. So if you’re replacing a plain .017 in a set, go for a .018w to keep the same tension, and if you’re replacing a plain .018 or .019, go with a .020w. That gauge is thin enough that you can bend it almost as well as you can a plain string, but you get all the added fullness of a wound string—it’s the best of both worlds. But that’s just one example—go crazy, have fun, and if we can ever help with anything, just holler. You need a wound 3rd if you've screwed the bridge saddle for the G string back as far as you can, you're "in tune" according to your tuner, and the intonation is good w/ the other 5 strings, but you still sound like crap when you play a D chord. Thank you for this comment. The first very instructive discussion on this G-string issue. Thank you again.